Besides expressing solidarity with the disenfranchised, Sujatha is a rallying force in Karimnagar's environmental movement. Telangana's Karimnagar district has become the latest battleground in the clash between Dalit-bahujans and the right-wing. Over the past week, a now-familiar template of contestations over freedom of speech, assertion of identity and nationalism has unfolded at the Satvahana University. Sujatha Surepally, an academic-activist who was only peripherally involved in the initial incident, has unwittingly become a key figure. On December 25 a group of Dalit students burnt a piece of paper outside the campus with 'Manusmriti' written on it, as part of the wider dahan diwas against the text observed on that day. Some right-wing activists, allegedly from the Bharatiya Janta Party, who were leading a rally commemorating Atal Behari Vajpayee's birthday, barged in and a clash took place between the two groups. Things spiralled out of control after this. Sujatha says she was in Hyderabad that day. She posted a message on her Facebook wall that the RSS had attacked Dalit-bahujan students at Satvahana University and it went viral. Within hours, the online backlash began. Local news channels allegedly reported that pictures of Bharat Mata had been burnt and that Sujatha was the instigator. Trolls online dug out her photograph and circulated it on social media with suggestions that she was anti-national and had Naxalite connections. 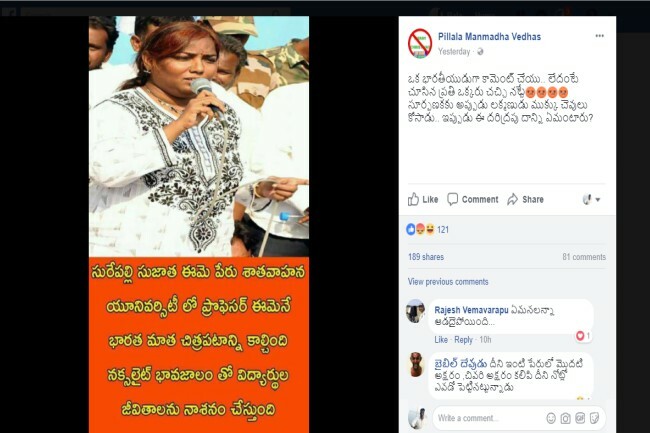 A Facebook post in Telugu by someone called Pillala Manmadha Vedhas carried her photograph and identified her by name. It says she burnt photos of Bharat Mata, has Naxalite connections and is leading students astray. He also asks people to comment "as Indians" and those who fail to do so might as well be dead. More chillingly, he wrote, "Lakshman cut off Surpanakha's ears and nose then, what should be done with this wretch now?" The nature of the post is akin to setting up Sujatha Surepally for target practice online. It attracted all kinds of vile abuse and death threats directed towards Sujatha. One person, Murali Kishore, commented that "it's time for her to go". Press reports from Telangana state that the Commissioner of Police, Karimnagar, Kamalasan Reddy, thinks no crime had been made out and the online abuse amounted to defamation. What is important to remember is that the attack on Sujatha is more than an attack on just a Dalit writer-academic-activist. It is a frontal attack on at least three different sections of people, who constitute a large majority of the underclass in Telangana and Andhra Pradesh. Sujatha Surepally is not just a Dalit activist. She is a rallying force in the environmental movement in Karimnagar, which is opposed to extractive industries. In this case granite mining, which was a Rs 3,000 crore per annum industry. She has also been at the forefront of the movement against student suicides on campuses, which have taken a particularly brutal toll in Telangana. And hers was a voice that tried to ensure that Dalit/bahujans and minorities found justice and dignity. This put her at odds with everyone: those in power and those aspiring to power in India's newest state. The assault on Sujatha is firstly an attack on young people, particularly from rural and non-privileged backgrounds. 90% of the students at Satvahana University are from SC/ST/BC and minority backgrounds. They gravitate towards state universities like SU because they have nowhere else to go. Jobs are scarce and education seems to offer a way out, a path to upward social mobility. However, the avenues that could ensure a direct path to employability (professional courses like engineering, medicine and management) are not open to them. So, they end up in the only place they can -- state universities in small towns and cities close to their hinterland. Secondly, Sujatha's environmental activism was directed against the rapacious extractive industries that operate with impunity in Telangana, and across India. People with small landholdings in rural areas depend on the local environment and natural watershed movements, which are being devastated by the granite mining mafia in Karimnagar. Sand mined from river and pond beds further destroys the water balance. The trucks that carry the minerals speed recklessly on village roads, causing accidents. In an incident last year, angry villagers burnt 5 trucks in protest. Finally, people who want to live a life of dignity and justice will feel even more under siege if Sujatha's voice is silenced. The academic has been a forceful voice in expressing solidarity with the disenfranchised in the two Telugu states. She had a key role to play in the arrest of a local strongman who was threatening 2 Dalit men and even allegedly kidnapped them. This person supposedly had links to the BJP, but the party disowned him. Demonstrations of solidarity in favour of Sujatha have been organized in Hyderabad by Dalit groups, women's organizations and left-leaning parties. Sujatha herself thinks that an attempt is being made to silence her voice because she is a Dalit woman who is not afraid to speak out, besides being a writer and an academic. She said that the viciousness of the online targeting has rattled her. She is currently not in Karimnagar and is apprehensive of the "silly questions and suspicious stares" that will greet her, she said in a phone conversation. "But I am not scared of going back," she added.